The Journal of Black Psychology has been the leading forum on the psychological study of Black populations for more than 35 years. Founded and sponsored by the Association of Black Psychologists, The Journal of Black Psychology presents the most innovative scholarly research and theory on the behavior of Black and other populations from Black or Afrocentric perspectives. The Journal of Black Psychology publishes scholarly contributions within the field of psychology toward the understanding of the experience and behavior of Black populations. This includes reports of empirical research and discussions of the current literature and of original theoretical analyses of data from research studies or programs. Therefore, the Journal publishes work in any of the areas of cognition, personality, social behavior, physiological functioning, child development, education, and clinical application, in addition to empirical research and original theoretical formulations outside traditional boundaries, all integrated by a focus on the domain of Black populations and the objective of scholarly contributions. 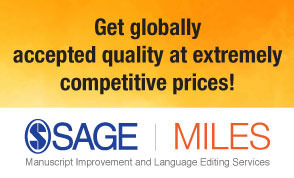 Manuscripts should be submitted at http://mc.manuscriptcentral.com/jbp, where authors will be required to set up an online account in the SAGE Track system powered by ScholarOne. Prospective authors may also wish to download the Editor’s Statement, published in the May 2009 issue. Full-length manuscripts reporting results of a single quantitative study generally should not exceed 35 pages total (including cover page, abstract, text, references, tables, and figures), with margins of at least 1 inch on all sides and a standard font (e.g., Times New Roman) of 12 points (no smaller). The entire paper (text, references, tables, etc.) must be double spaced. Reports of qualitative studies generally should not exceed 45 pages. For papers that exceed these page limits, authors must provide a rationale to justify the extended length in their cover letter (e.g., multiple studies are reported). Papers that do not conform to these guidelines may be returned with instructions to revise before a peer review is invited. Literature reviews generally should not exceed 40 pages, including references. Papers that do not conform to these guidelines may be returned with instructions to revise before a peer review is invited. In addition to full-length manuscripts, the journal will consider brief reports. The brief reports format may be appropriate for empirically sound studies that are limited in scope, reports of preliminary findings that need further replication, or replications and extensions of prior published work. Authors should indicate in the cover letter that they wish to have their manuscript considered as a brief report, and they must agree not to submit the full report to another journal. The brief report should give a clear, condensed summary of the procedure of the study and as full an account of the results as space permits. Brief reports should not exceed 15 pages in total length (including cover page, abstract, text, references, tables, and figures) and must follow the same format requirements as full length manuscripts. Brief reports that exceed 15 pages will not be considered. Every effort should be made by the author to see that the manuscript file contains no clues as to the author's identity. Footnotes containing information pertaining to the identity of the author or institutional affiliation should be on separate pages. Manuscripts, including references, must be double spaced throughout and must conform to guidelines given in the Publication Manual of the American Psychological Association (APA), 6th ed., 2010. The manuscript file should begin with a title page, omitting the author's name and affiliation but including the title and the date submitted. Following the title page should be a 100-175 word abstract and 4-5 keywords. The introduction section should follow and precede, in order, the Method, Results, and Discussion sections for empirical reports. Following in order should be note pages, references (entries double spaced and alphabetically listed), appendixes, tables, and figures. Table and figure locations should be indicated in text by callouts (e.g., "[insert Table 1 here]") inserted after the respective paragraphs. Figures must be camera ready.